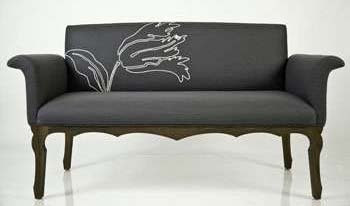 I'm feeling very "green" today and found this exceptional Eco-friendly Air Hazel Settee by Pure. 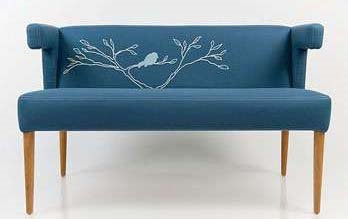 I'm loving the simplicity of it, especially the sweet little embroidered bird design. Available in 9 colors and with or without embroidery. Equally as stunning, the Fire Cyrilla Banquette, shown below, has a whimsical embroidered tulip and is available in 7 different colors. I love the detail on the frame which gives it a touch of elegance. Visit Structured Green for more fabulous Eco-friendly furniture and home decor. what a lovely blog you have here. a friend of mine tipped me off that you did a post on the met home color piece, lavender issue. i made the little lilac vase. if you'd ever like to see more work let me know, i admire your sensibility. i love these sofas & how much better green furniture is getting in the way of style. great find!! There are NO (alas, I mean it; I've looked!) stores here in the South that have beautifully designed modern furniture, let alone a store that focuses on eco-friendly goods and has an underlying green mission. They have a neat blend of recycled, re-purposed and organic textile products. When I first moved down here, I (gasp) drove five hours down to the nearest IKEA in Orlando. ANYONE who might be despairing and desperate for good design down here in the deep south, check it out! Thought it might be a good tip for the upcoming Earth Day.